Lighting can be controlled to create any atmosphere or mood. Dim lighting provides the perfect backdrop for relaxing or a romantic dinner while a brightly lit room is perfect for getting things done. Lighting is also used to enhance the appearance of a room by highlighting its architecture and design. Lighting can serve security purposes as well. Going away on vacation or out for most of the evening? Then simply program certain lights to turn on and off at various times throughout the day and evening to make it look as though someone is home. Outside lights can deter unwanted trespassers while inside lights can help house guests or a sleepy child navigate their way in the middle of the night. 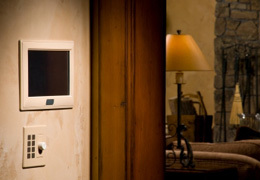 When you have a lighting control system you can conveniently control all your lights or a series of lights throughout your home with a simple touch of a button. A properly designed lighting control system saves energy, simplifies your life and provides security to you and your loved ones.